Acuvue Oasys for Astigmatism is a revolutionary type of contact lens. Most people with astigmatism think they can’t wear lenses but this product proves that this isn’t the case. They’re suitable for people with sensitive or dry eyes. Another advantage of these lenses is that you can wear them for an extended period of time. In this article, we review all aspects of the Acuvue Oasys for Astigmatism contact lenses, including comfort, pricing, and potential issues. 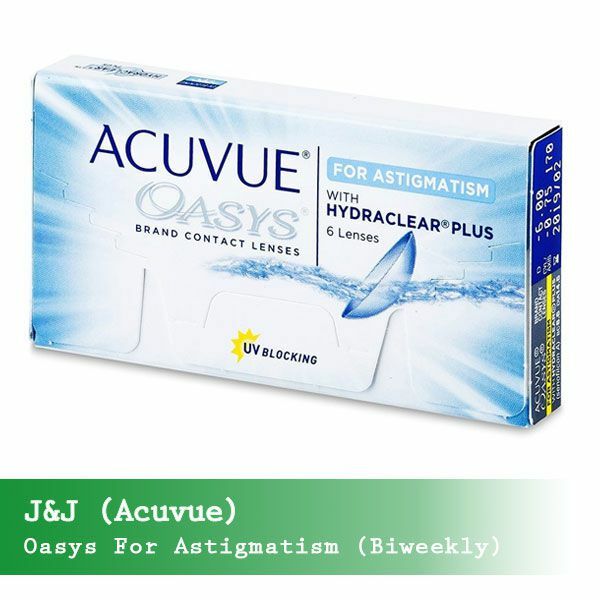 Acuvue Oasys for Astigmatism is 1-2 week disposable soft contact lenses manufactured by Johnson & Johnson. Each pack contains 6 tinted UV blocking lenses made from 62% polymer (Senofilcon A) in a buffered saline solution (38% water content). Historically, contact lenses weren’t suitable for people with astigmatism. The irregular curve of the eye that characterizes the condition made it difficult to find lenses that fit correctly. However, Acuvue Oasys for Astigmatism’s design largely makes it suitable for people experiencing dry eye symptoms. Thanks to Acuvue’s Accelerated Stabilization Design, these lenses won’t move around your eyes quickly or rotate annoyingly when you blink. If you lead an active lifestyle, then you won’t need to worry about your astigmatism holding you back or blurred vision. They come with Hydraclear Plus technology that keeps the contact lenses wet and smooth at all times. This is important for people with astigmatism and other related eye problems. Combined with the Accelerated Stabilization Design, this creates the perfect astigmatism contact lenses that you can wear all day long. Acuvue Oasys for Astigmatism is toric contact lenses. These kinds of lenses come with a design that helps in reducing discomfort from wearing contacts. Toric contacts are usually soft lenses and contain a conventional hydrogel or highly breathable silicone hydrogel. However, there are others that often contain rigid gas permeable materials too, all of which are good for astigmatic patients. Toric contact lenses are different from regular spherical lenses in two ways. They have varying strengths in different meridians which enables them to correct for nearsightedness or farsightedness. They also have the ability to rotate to the correct orientation on the cornea, which means the lens meridians align with those of the eye. This produces a clear vision for people with astigmatism. Astigmatism contact lenses tend to cost a little more than regular ones for a couple of reasons. Firstly they have a more complex design which makes them more expensive to manufacture. The material, design, and optical retailer you choose will all influence the total price you pay. Fitting astigmatism contact lenses also require a higher level of expertise than fitting regular contacts. An eye care professional who specializes in toric lenses may, therefore, be more expensive than a typical consultant. This can add to the overall cost of wearing contact lenses for astigmatism sufferers, but many think it’s worth it in the long run. Acuvue Oasys for Astigmatism pricing can vary from $42 to $50 for a box of six lenses. Coastal.com usually offer the best pricing along with free delivery. They also give discounts for orders over $99 and occasionally release promo codes too. We’ve found them to provide the best value all round, plus they offer a flexible return policy that includes free postage. Astigmatism manifests itself differently in everyone. This means that no two eyes with astigmatism are the same, and each has its own unique characteristics. It’s this uniqueness that means people may need to try several pairs of contact lenses before settling on the type that’s right for them. Trial and error will lead you to the best brand and design for your own specific needs. However to speed up the process (and save you some money along the way) we’ve compiled a thorough review of Acuvue Oasys for Astigmatism contact lenses. Acuvue Oasys for Astigmatism lenses are incredibly comfortable. Many people report that they forget they’re wearing them which is exactly what you want in a contact lens. They’re light, thin, and easy to adjust which adds to their comfort. The Accelerated Stabilization Design helps to minimize shifting so your lenses don’t move around your eyes or rotate as you blink. And they come with a material called Hydraclear Plus technology that helps keep your lenses wet and smooth. If you live in a dry or dusty part of the United States then these contacts are ideal since they retain their moisture. Acuvue Oasys for Astigmatism lens is suitable for extended wear. The soft material and Hydraclear Plus technology mean they won’t irritate or dry out your eyes. If you need to wear contact lenses all day for work or study, then these are the perfect solution. Even people with sensitive eyes report wearing them for 15 hours a day without adverse effects. These contact lenses are suitable for daily use rather than monthly. Although they’re not designed to be slept in, many people also report doing so without any irritation the next day. If you have sensitive eyes with astigmatism, then these are the contacts for you. The soft material and hydrating features mean they don’t aggravate sensitivities or cause your eyes to become dry. In fact, people with allergies report that they prefer this product over others for this reason. Longevity is a potential issue for some people. The contact lenses seem to be great for the first few days, but after a week or so they are no longer comfortable. For some, they start to cause irritation, itching, or cloudy vision after a certain amount of time. Some people also report that they experience a protein build up after a while. However, an equal number state the opposite and are impressed with the lack of build-up, so it seems that this issue is a matter of personal experience. Acuvue Oasys provides some of the best eyewear products currently available on the market. Their toric features ensure that they’re suitable for a wide variety of astigmatism situations and can adapt based on different people’s needs. The soft material and Hydraclear Plus technology create a comfortable fit that can be worn contentedly all-day long. Their Accelerated Stabilization Design ensures visual stability by minimizing shifting of the lenses. This avoids uncomfortable situations such as your lens moving around in your eye or rotating when you blink. Seemingly simple details like this add to the overall usability and enjoyment of wearing contact lenses. These lenses are great for people who like to have the option of extended wear. They facilitate clear vision throughout the day and won’t irritate your eyes, even late at night. The fact that people with sensitive eyes like the Acuvue Oasys are enough of a testament to their gentleness and quality design. Astigmatism contact lenses tend to be on the pricier side since they’re more expensive to manufacture and require specialist knowledge to fit. However, we think Acuvue’s range is great value for money, given how comfortable they are and the fact that they’re suitable for extended wear. The best price we found was available via Coastal for $42 at the time of writing. Although prices can change, this site is a pretty safe bet based on their rave customer reviews and fair refund policy. Always consult your eye care professional for personalized optical advice. It’s important to seek the advice of a specialist in this area before commencing a new treatment.